2. SHARE this post by clicking on the “Share” link at the bottom. Make sure your post is set to public, otherwise your name will not be visible. 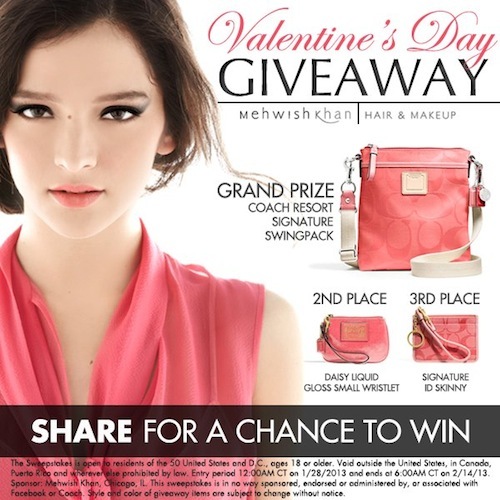 Three (3) winners – one for each prize – will be announced on Valentine’s Day. Winners will be selected at random from all qualified entries. Actress Odette Annable (yes, the hot girl from Cloverfield, and more recently on House MD and Breaking In) always looks picture-perfect on the red carpet. Which is probably why she was plucked amongst all the Hollywood starlets to be Clear Scalp & Hair Beauty Therapy’s spokesperson. And that alsooo means I got to pick her brain on what her favorite Clear products are, her go-to everyday hairstyles, and even her favorite DIY tip from her Cuban mom :). Odette, who was in LA for the interview, was game for all my questions and the fun part is while I knew it was recorded, I didn’t know she was all dressed up on the other end for a video recording as well…JUST for you lovely BATF readers :). Check it out! Thanks to Odette for being a great interview! Check out Clear’s Facebook page for more info on their shine-inducing products! …because lately, my bed has been far too comfortable. I know. I desperately need a manicure. 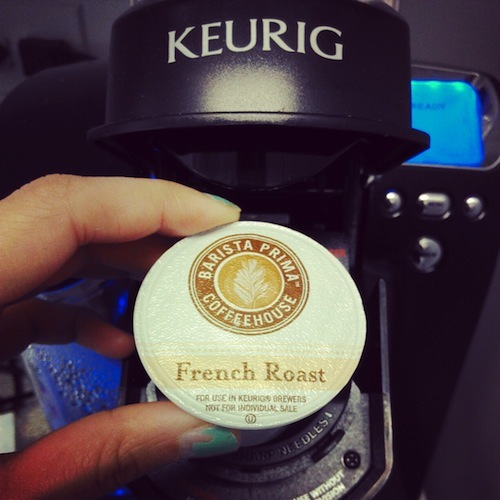 1) My Keurig and a dose of Barista Prima in French Roast. This basically means I don’t have to wait in a ridiculous line, and I get a strong, flavorful cup of coffee in just a couple minutes. 2) Frank Ocean songs. I go through waves of obsession with certain artists and this is my happy place. I have my playlist all set up for my short commute to work. What helps get you up in the morning? Taco Town. Saturday Night Live could just write my blog for me at this point. My friend Sharaf thought if Taco Town existed, it would be my favorite place ever. I think he was joking, but he’s actually correct. I would love this place. I actually don’t find anything funny about this SNL skit — it’s basically my dream come true. YOU KNOW it’s freezing when you see that it’s 14 degrees outside and you think, “That’s not bad for this week!” Coming back to this cold from sunny Miami has been…jarring. But it’s OK people! Cold is character-building! Smile! AND it gives you a reason to use those super-rich, delicious creams that you can’t quite get away with in warmer temperatures. 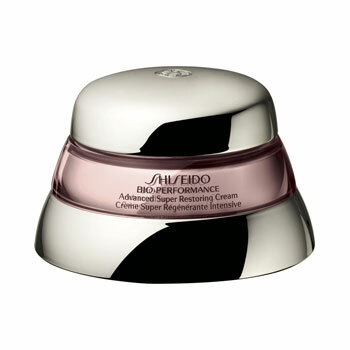 Shiseido’s Bio-Performance Advanced Super Restoring Cream has been keeping my skin baby-smooth through these arctic conditions. The indications are to smooth and firm your skin, but it’s also super hydrating. I noticed a difference in only a few days of using it and, I haven’t had to deal with any dryness or irritation since then (my skin is pretty combo). Another thing I love is that it’s rich, but not greasy and absorbs super quickly. A little goes a long way, so if I’m in a rush or about to put my makeup on, I don’t have to worry about it getting messy. Plus, can you imagine how pretty this looks on my nightstand? It doesn’t come cheap: $99 for 50 mL and $124 for the 75mL. But when it comes to skin creams that work, I’m all for it. What moisturizers are carrying you through this cold? For those of you who are in the cold. The rest of you, I’m jealous. 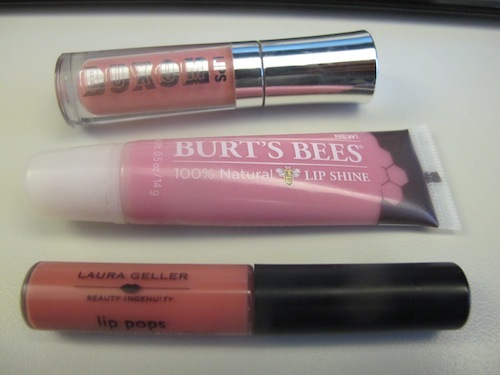 3 glosses I have to fight my friends for. Sort of. We don’t REALLY fight. BUXOM BIG & HEALTHY LIP POLISH IN APRIL, $19 for full size: I’m a big fan of this line (my all-time favorite color is Dani, in original pink/berry). It always leaves the perfect shimmering color and gives a little (non-irritating) lift to lips. I was carrying a mini-travel friendly size (which came in an AWESOME limited edition set that you can now only find on eBay at best! ), but you can still find the full size at Sephora if you want to experience it in all its pink, sparkling glory yourself. BURT’S BEES 100% NATURAL LIP SHINE IN WINK, $7: These are the LATEST launch from the brand, and they are the most amazing, buttery, sheer glosses I’m convinced you’ll love. It’s a totally natural formula (shea and cocoa butter, sunflower, and of course, beeswax) that hydrates and has the most delicious apricot-flavor. Love that it gives a beautiful color and conditions my lips as well. LAURA GELLER LIP POP IN PALAZZO PETAL, $17: Since we’re talking about delicious glosses, it’s really hard to top Laura Geller’s Lip Pops. They straight up taste like strawberry candy and its shade of Palazzo Petal is a gorgeous shade of creamy pink. I think I had a odd-almost-but-not-as-much-as-I’d-admit bout of depression for the 5 minutes I thought I lost this somewhere in our hotel room because there’s really nothing like it. You can buy these individually for $17, but (HINT!! ), they have a SIMILAR shade that comes in a lip gloss trio on sale right now at Hautelook.com (normally $36 but only $22 right now). If I were you, I would jump on that. For now, these have found a permanent place in my purse. What are some of your favorite lip glosses?